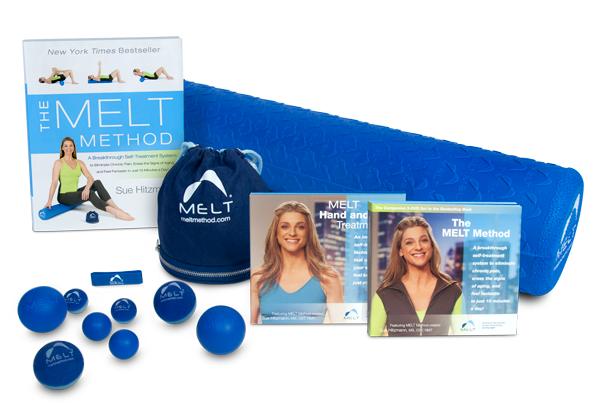 Sue is the creator of the MELT Method®, a simple self-treatment technique that helps people get out and stay out of chronic pain. A nationally recognized educator, manual therapist, exercise physiologist, and founding member of the Fascia Research Society, Sue is the author of the New York Times bestselling book The MELT Method, which has been translated into eight languages and helped over 200,000 people lead a healthy, pain-free life. Sue’s journey to help others live a better life began in the world of fitness in 1986. In 1999, she starred in the Crunch video Boot Camp Training, which has sold more than half a million copies. Sue’s interest in neuromuscular and manual therapies began when she was in her twenties with her quest to find a resolution to her own debilitating pain. Even top doctors and physical therapists couldn’t explain what was going on in her body. In hands-on bodywork, she found solutions she was desperately seeking. Determined to share this, she changed her focus from fitness to manual therapy and became known in New York City as the person who solved seemingly impossible pain issues. In 2001, Sue was inspired to create “homework” for her clients, which led to the development of the MELT Method – the first-ever form of Hands-off Bodywork®. Now with her bestselling book and the products Sue personally designed, anyone, anywhere, can take steps to restore whole-body efficiency and lead a healthier, more active life. Sue has appeared on the Dr. Oz Show, Nightline, The Rachael Ray Show, Good Morning America, and Live! with Regis and Kelly, and MELT has been featured in publications such as SELF, More, Prevention, and the New York Times. She has empowered tens of thousands of people to live healthy, pain-free lives and has trained over a thousand instructors to share the secrets to pain-free living.